Weighs only 4 lbs. (8 lbs. with batteries). 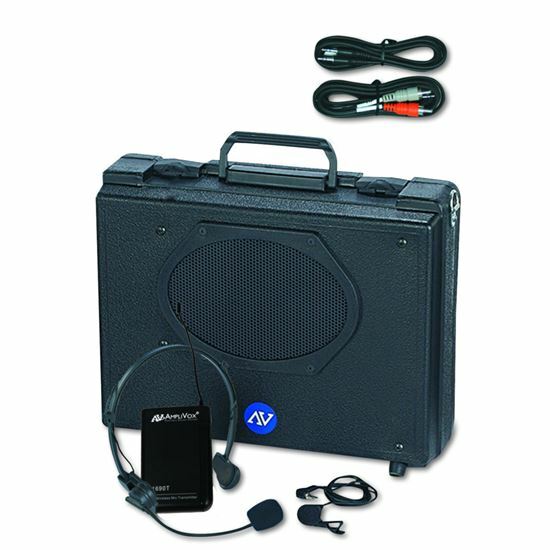 Contains AmpliVox 50-watt multimedia stereo amplifier with built-in UHF 16 Channel receiver and one 6” x 8” Jensen design speaker built into rugged, durable case. Includes 16 Channel UHF wireless lapel & headset mic + transmitter, shoulder strap, and 2 audio interface cables ( 7-ft; stereo 3.5mm male/2 RCA jacks; computer interface cable 5-ft; stereo 3.5mm male/male jacks. This system is also an excellent companion for your video projector or laptop. Power with 10 D-cell alkaline batteries (not included) for up to 200 hours; S1460 International AC Adapter/recharger; or S1465 Rechargeable Nicad Battery Pack (requires S1460).